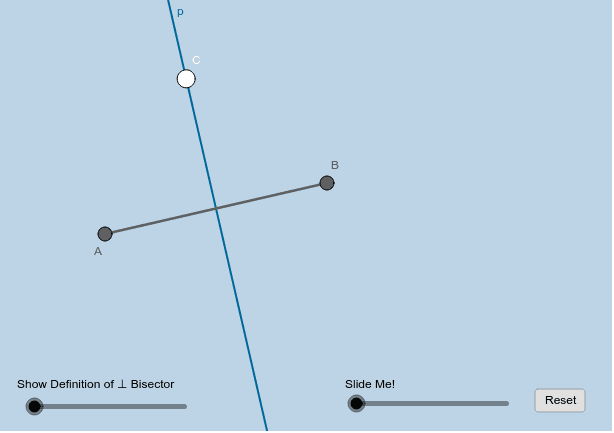 In the applet below, line p is the perpendicular bisector of the segment with endpoints A and B. If you forgot what it means for a line to be a perpendicular bisector of a segment, you can slide the slider on the left for a reminder. You can also revisit this worksheet﻿. The slider on the right gives insight into a theorem that holds true for every point that lies on the perpendicular bisector of a segment. Interact with this applet for a few minutes. As you do, be sure to change the location of the white point C each time before you re-slide the slider. Answer the questions that follow. Questions: 1) What do you notice about the distances (lengths) AC and BC? 2) Does your answer to question (1) above hold true for every point on this perpendicular bisector? That is, is your response to question (1) the same regardless of where point C lies? 3) If your answer to (2) was yes, prove this assertion true in the format of a 2-column proof.